Travelers should expect to pay more for gas over the holidays this year than than they did last year. Unfortunately that’s not the only bad news on the horizon for drivers. 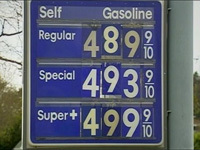 Experts are predicting that gas prices could rise as high as $4.50 a gallon in high traffic states like California by Spring of 2012. A combination of growing global demand and rising U.S. fuel exports could send gasoline prices to record highs in 2012, according to industry analysts. Those factors have been pushing pump prices to historically high levels since the beginning of September, and the approaching holiday weekend is expected to present a painful roadside example by breaking the old record for late November — set in 2007 — by 10% or more nationally and in California. Regular gasoline nationally cost an average of $3.097 a gallon during the week leading up to Thanksgiving in 2007, and it cost an average of $3.398 in California. It might have been a relatively trivial annoyance then, as the country hadn’t fallen into recession yet. But now, with high unemployment and little economic growth, the U.S. average gasoline price is $3.424 a gallon, the Energy Department said Monday, based on a weekly survey of service stations. Although that represented a decline of 2.8 cents from the previous Monday, the average was still nearly 56 cents higher than at this time last year and shattered the old record for this week of $3.013 a gallon, set in 2007. In California, a gallon of regular gasoline is averaging $3.855, up 0.9 cent from a week earlier. That is substantially higher than the old record for this week of the year of $3.231 a gallon, set in 2007. Kloza said Americans are on pace to spend a record $489.7 billion on gasoline in 2011, which is $100 billion more than they did in 2010. The only year that came close was 2008, when U.S. motorists spent about $448 billion on gasoline; that year, the U.S. average peaked at $4.114 a gallon and the California average hit a record $4.588, but prices quickly declined from those summer highs. The primary reason for the stubbornly high prices is growing demand in Latin and South America, which is driving record U.S. exports of fuel to those parts of the world, particularly in the form of diesel. U.S. refiners are also making more diesel at the expense of gasoline production, Kloza said.